Posted	 May 19, 2017 by	JHSD - Course & filed under Community, Dharmic Education, Events, Legacy Organizations, Your Stories. Editor’s Note: You can find more information about the Journey Into The Heart of Sikh Dharma telecourse, including the course description, schedule, and presenters here. Pretty much whatever you’re seeking (or “Sikhing”) can be found in a magical tele-course that goes by the acronym JHSD. By exploring the depths of your heart and becoming intimate with your soul, you enter with questions and exit as You. 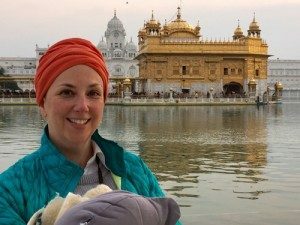 I signed up for Journey into the Heart for a specific reason: I was about to lead a yatra which included the Golden Temple in Amritsar (the epicenter of the Sikh faith) and I had never so much as set foot into an actual Gurdwara. I needed some wisdom to build my credibility and lead this trip with confidence. As a Kundalini Yoga teacher, I have been stirred by the Shabd Guru and transformed by the sound current. I also had an inkling that by immersing myself in Sikh Dharma, I might bring more authenticity to my yoga teaching (while one does NOT have to practice Sikhism to practice Kundalini Yoga, Sikh Mantras are a key technology which make the practice so effective). JHSD delivered on the nuts and bolts of Sikh Dharma in spades and answered questions I didn’t even know I had: What is a Mehl? How is the Siri Guru Granth Sahib organized? What are my wishes for the last moments of my life? What is the most effective way to recite Japji? And what about the other Banis? But it was so much more. I learned about true humility and Seva from our moderator, Mata Mandir Kaur Khalsa. Her love, passion for the Dharma and neutrality created a cocoon of sacredness I came to crave. Every two weeks we were given an inspiration to ponder in the heart, discuss in “buddy calls,” and then respond to in written assignments. This is where we dove right into the very heart of the practice, of truth, meeting God through the writings of our fellow classmates and divine presentations from lights like Yogi Amandeep and Snatam Kaur. We laughed, we cried and we left every conversation floating on air, hungry for more divine wisdom (from presenters and fellow Sikhs alike). One of the gifts of the course is the gift of Sangat, a like-minded community of faith. Don’t get me wrong, like-minded does not mean homogenous or conforming. Our Sangat was so diverse, including practicing Catholics, an Indian-born Sikh looking for added dimension to her practice, economists and business people, wearers of bana and those who had yet to tie a turban. We hailed from all over Europe and the U.S. Our group was so diverse, yet united by our love of Guru. We honored each other’s uniqueness, because each was an expression of God’s creativity. In the way, JHSD welcomes and embraces you exactly where you are on this path. JHSD creates deep and lifelong friendships, which I experienced when I found myself in France on a business trip earlier this year. The only soul I knew there was a fellow student from my group. I will never forget stumbling off the red-eye, and immediately meeting up with my JHSD sister, pedaling bikes around Paris as if we had known each other for lifetimes. I think we have. JHSD steeped me in Sikh history, values and practices. It deepened my relationship to Guru, which bathes my every action in the amrit of peace. It was fun! JHSD also busted the myth that because I am the only one reciting Banis in my home, I am alone on this journey. I now realize my family is on this journey of faith together, as a true Sikh defends another’s right to connect to the Divine in any way (whether riding a bike, writing a poem, playing an instrument or even a video game). So did I feel confident leading students through the Golden Temple and partaking in prayer and Seva there? Yes! For me, JHSD illuminated my yoga practice, infusing it with the true stuff, the real stuff…the God stuff. I am looking forward to savoring the JHSD experience for a second time this year—to reconnect, dig deeper and make new friends. When you realize all is God’s Hukum (command), you know that all is as it’s meant to be, and there is no need to judge anymore. And when you’re out of judgment, you are in bliss. Join me in the bliss.